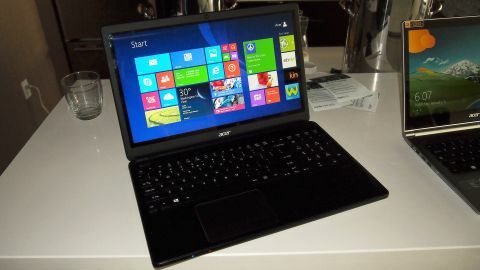 We reviewed the previous version of the Acer Aspire V5 recently and weren't terrifically impressed with it, but Acer has tried again with this updated model that we were shown at CES 2014. It's a budget €599 (around GBP £500, USD $817, AUD $903) Ultrabook that makes several compromises to hit its price point. Most interesting is the fact Acer has responded to feedback on the previous V5 and has reintroduced an optical drive into the mix. At this price point it seems people still want a way to install legacy applications from disc. The drive also features M-DISC technology, which is designed to make discs resistant to extreme conditions as well as age. Essentially, it means your data lasts longer thanks to a modified layer on the disc. You need to buy special M-DISCs to take advantage of the drive, but the data can be read by any DVD drive. The 15.6-inch laptop comes with up to 16GB of RAM, plus a 1,368 x 768 HD LED-backlit display (not Full HD, note) with 10-point multi touch. The display features what Acer calls Direct Bonding technology for closer screen layering, which increases contrast ratio. AMD Radeon R5 or R7 graphics are included depending on the specification you choose, as well as one of the range of lastest-generation Haswell Intel Core processors. The trackpad is sizeable and reasonably responsive, while the keyboard is standard Acer fayre - nice enough to use, but not the best you've ever experienced. Appearance-wise, the V5 is utilitarian, but the silver lid does make it seem a little more distinctive than your average black laptop. The V5 comes toting Windows 8, though we'd expect it to have Windows 8.1 by the time you get your hands on one. There's full-size HDMI and also - hanging round like a bad penny - VGA for hooking up the laptop to external displays, alongside a USB 3.0 port, Ethernet, headphone jack and SD card slot on the front. We'd expect this version of the V5 to do better when it comes to our review, simply because it seems like a powerful combination of Intel processor and AMD graphics. We're also hoping it fares better in terms of battery life; the previous model only gave us 3.5 hours of use. If our hopes are realised, this should be an excellent budget choice.